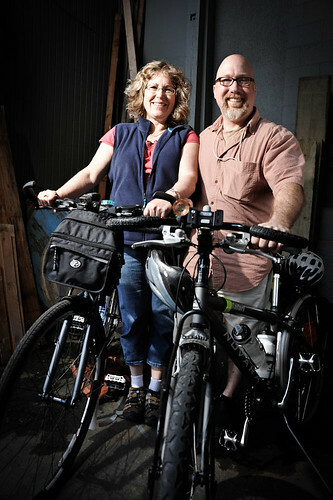 For the last few years, Seattle cyclists have always looked on with envy at BikeCraft, Portland’s bikey craft show. For the uninitiated, you could buy everything from clothing, rain capes, art prints, bike mustaches to coloring books at BikeCraft. This weekend, a few handmade bike gear makers who were tired of waiting for something to happen organized their own show, Pedaler’s Fair. 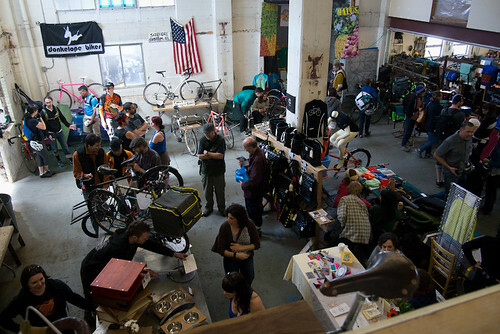 Put on by Ryan from GoMeansGo and Jason, Martina and Sonia from Swift Industries , Pedaler’s Fair was Seattle’s first independent bike show outside of the very large Seattle Bike Expo. 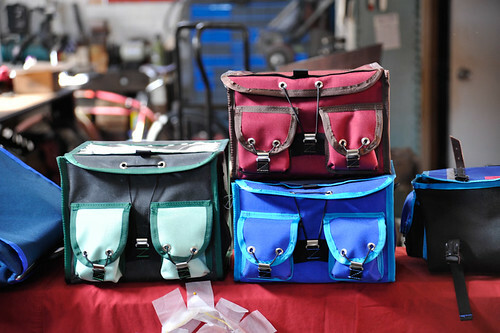 The venue was a working studio space for several makers and lent an industrial feel to the show. 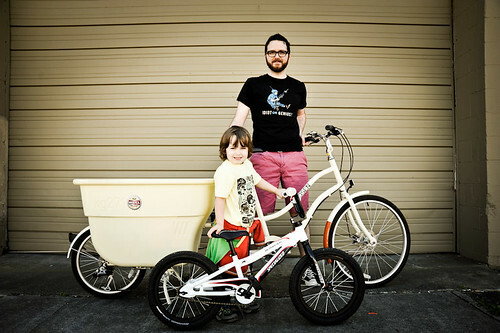 Haulin Colin is well known in the Seattle bike scene, particularly for his work with cargo bikes. At the show he debuted a non-destructive cycle truck conversion kit. 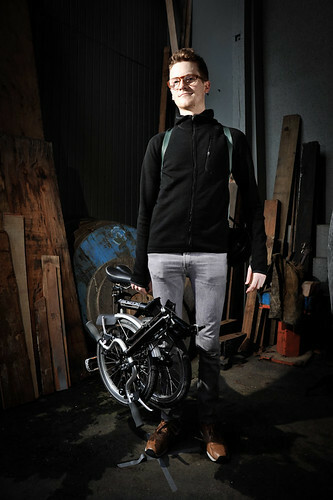 Think of it as the Xtracycle for front loaders! We have an affinity towards cycle truck and think of them as more of an Everyman’s long-john that can still be transit friendly. This conversion kit will be something to watch in the coming months. 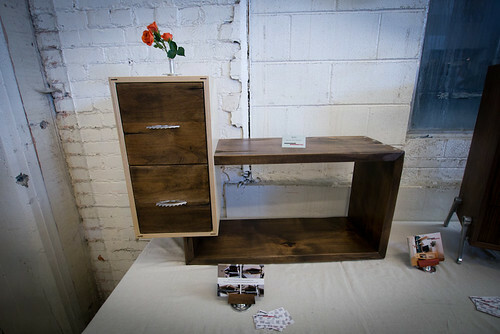 The beautiful and functional furniture of Independent Woodworks caught our eye. Jesse had some amazing wall mounted shelving units that held up bikes to cabinetry that had cogs as handles and crank arms as feet. 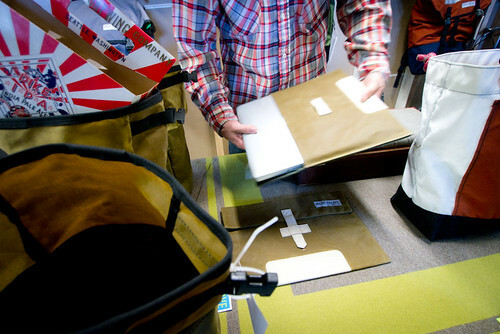 Another standout was John from HighAbove who has been working with Cuben Fiber, a sort of super fabric that is stronger and lighter than Cordura. 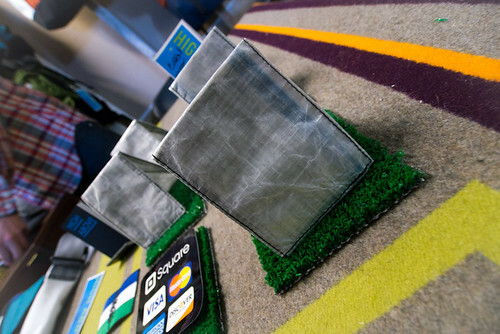 He had on display some wares using Cuben from a “touring wallet” which weighed a scant 7.51 grams. 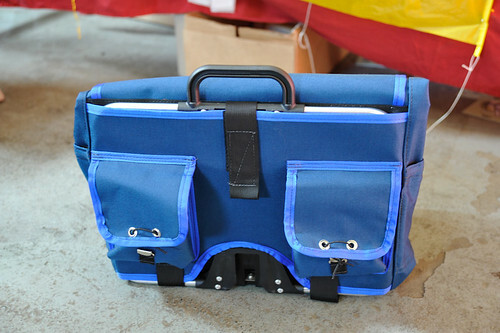 John also had a rucksack and some classy computer cages made with an oil-cloth on the exterior. 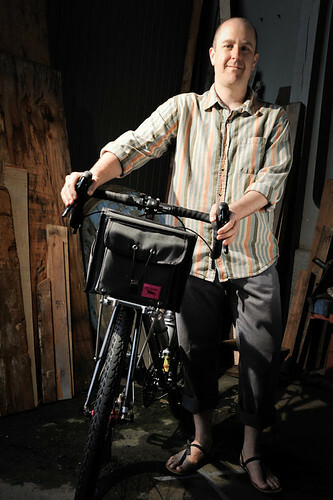 He hinted at making panniers from Cuben with carbon fiber hardware that would weigh less than an Ortlieb! 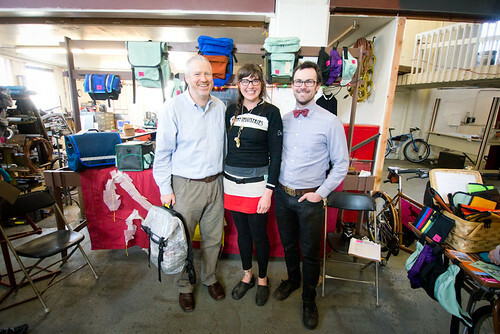 Swift Industries had their Bilenky cargo bike out with all their latest wares, including lots of multi-colored rando bags and even a brightly colored Brompton bag! 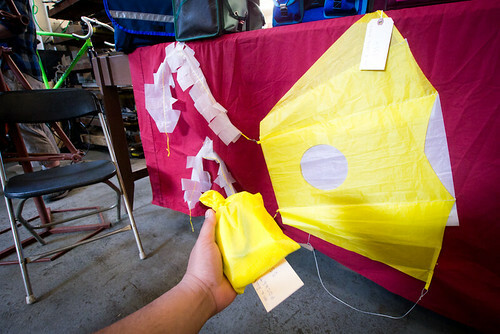 One small item that I was pretty excited about was some pocket kites that Jason’s dad is making. We are big fans of bringing non-bike related items along to introduce some fun while bike touring and these pocket kites are perfect. Another notable mention was T’s Leatherworkz. 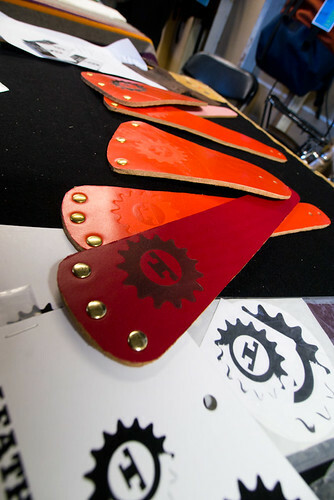 Tarik, a full-time chef and bike aficionado is just entering the bike craft industry and is making brightly colored leather fenders with rivets. They look great and last long (with some proper proofhiding) even in Seattle’s wet weather. He has a brand that he heats up on a stove at home to burn in his signature T. At $19 per flap, they are a steal! We gave a presentation to about 30-40 people about our travels and got to meet some longtime readers. It is always a special treat when we get a chance to talk to someone who has been following for the last three years. 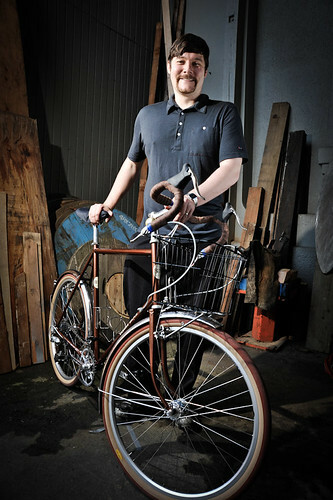 During the event, I did some bike portraits for show attendees. Even though it was only the first year of Pedaler’s Fair, the organizers managed to put together a really great bike event. Perhaps the true measure of its success was the diversity of cyclists that showed up. Seattle has a reputation for a really stratified bike community with very little overlap. However, at Pedaler’s Fair roadies, commuters, family bikers, cargo bikers, bike polo and fixie kids were all in the same room celebrating cycling in all its forms together. Can’t wait for next year. Looks like a cool event . 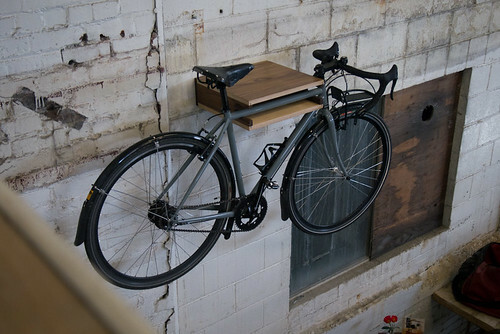 The bike holder shelf is awsome , not sure my wife would approve of my bike on the front room wall tho lol . Lots of great stuff there this weekend. It was cool to see so many local brands under one roof. love the swift stuff! btw…what is the bike that is pictured, fifth up from the bottom (guy with sandals holding it)? Looks like it was cool! Wish I had heard about it more than two days in advance, it would have been nice to hop on the Cascades from Portland to make a weekend of it in Seattle! One thing, however: I was a little bummed when I checked out the vendor page and it indicated that it was for “Washington vendors only”. 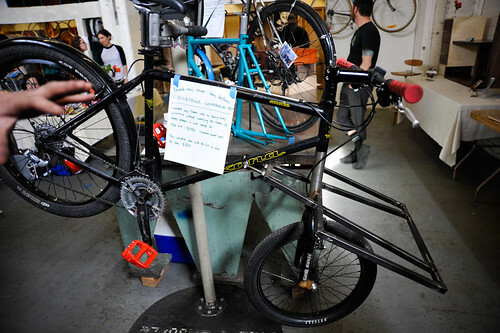 As far as I know, Bike Craft doesn’t care where you are from, though it is definitely Portland-focused. I wish the promotion and coverage was more in depth to be honest. Thanks for the great write up, the portraits, your presentation and coming to welcome our first year!